Are you looking for fieldtrip ideas? 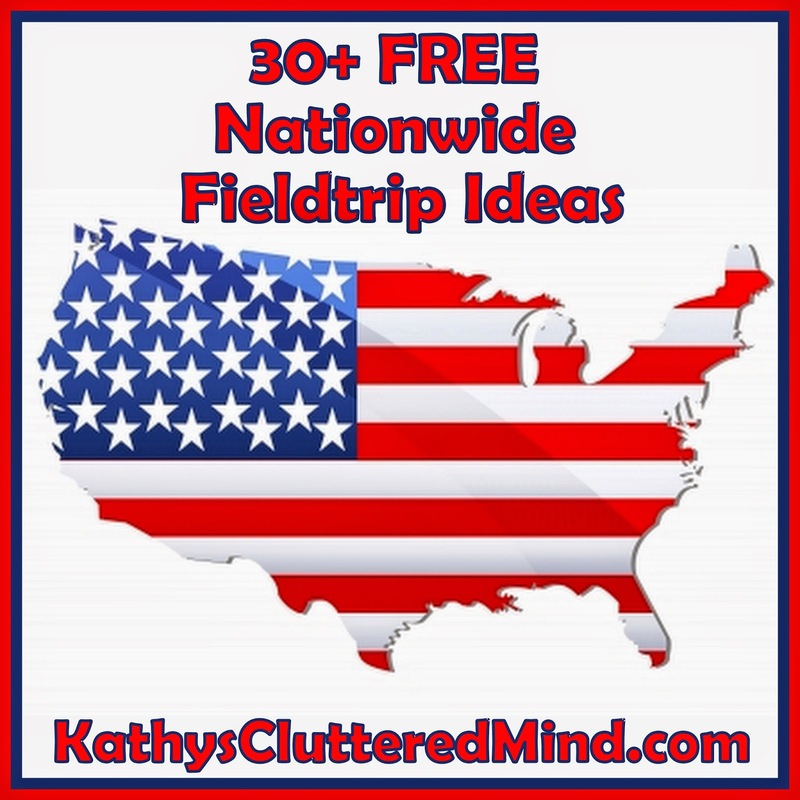 How about FREE fieldtrip ideas? Well here is a list of over 30 ideas to get yous started. The ideas on this list are available in EVERY state! Some are events that are offered every month, others are places you can have free fun all of the time. Please note there are a couple of things on the list that are only free on certain days during the year. See fieldtrips don't have to be complex or cost a lot a money to be fun and educational! “Congratulations! Today is your day. You're off to Great Places! You're off and away!” - Dr. Seuss, Oh, The Places You'll Go! 1) Home Depot Kids Workshops - The Home Depot offers free workshops for do-it-yourselfers of all ages and experience levels. The first Saturday of every month kids can make a fun project for free. Projects include things like cars, flower planters, pencil boxes and more. 2) Lowes Build and Grow Workshops - Lowes offers free workshops twice a month for children of all ages. Kids also get an apron, goggles, patch and more. Projects include cars, picture frames and more. 3) Michaels Craft Store - Every month Michaels offers free craft projects for kids. The passport to imagination event that runs every summer costs $2 per craft but it's a great way to learn geography through the summer! And don't forget about the homeschool 20% discount on all purchases. 4) Barnes and Nobles - Every month Barnes and Nobles offers story times, author meet and greets, hands on projects and more. And don't forget about the educator discount here too! 5) Learning Express - Learning Express offers play days every month. Play days involve stories, crafts and more generally centered around a product like American Girl, etc. 6) LEGO Store - Every month LEGO stores offer free mini model builds. The mini builds are only available for the first 250 kids, special mini builds are generally only available for the first 100-150 kids. 7) Pottery Barn Kids - Join Pottery Barn Kids every month for story times, scavenger hunts and more hands on learning fun. 8) Lakeshore Learning - Every Saturday from 11 am - 3 pm join Lakeshore Learning for free crafts for kids. 9) American Girl Store - American Girl offers monthly in-store crafts and cooking classes to tours that get your daughter out and about, every special event is designed with girls in mind! These events generally include information about various time periods! 10) Kids Bowl Free - Registered kids receive 2 free games of bowling daily ALL summer long. 11) Kids Skate Free - Skating is a great physical activity for both adults and children. Register your child at your local skating rink so they can enjoy free skating on select days/times. There is a fee for skate rentals. 12) Local Library - Remember to check with your local library for information on classes and events. Don't forget to also check with your library to see if they offer passes for local attractions (for example the Fulton County Library here in GA has Puppetry Center, Zoo, Fish Hatchery and GA State Park family passes that can be checked out). You can even ask your library about providing your kids with a tour so they can learn about why libraries are important, what the Dewey Decimal system is, etc. 13) Fire Stations or Police Stations - Both of these places are more than happy to offer free tours, all you need to do is ask. The tours we have been on have allowed children to try on equipment and sit in vehicles! We have even had a K9 demonstration. And a lot of times they also have free goodies for kids too like firemen hats and coloring books. 14) Nursery/Greenhouse - So much can be learned during a trip to a local nursery or greenhouse. You don't even have to know anything about the plants and flowers because everything has little informational tags! Many chain nurseries like Pikes Nurseries offer free workshops too. 15) Free National Public Garden Day - Every May right before Mothers Day several sponsors come together to offer free admission to local gardens. Check the BHG website often to see when 2014 dates will be announced. 16) Pet Stores, Animal Rescues, Farms - Several times a month we visit a local horse rescue Save The Horses and our local Petco store. Lending a hand at a shelter or rescue can be rewarding and fun! A visit to the local pet store is always exciting. Ask a store employee to get out a few furry or scaly friends for kids to hold or pet, generally they don't mind. Many pet stores also have brochures available that kids can take home to learn more about the animals. Visiting these locations is a great way to learn about animals, agriculture, helping animals in need and more. 17) Resturant Tours - Many restaurants will provide you with a free tour if you ask. We did a tour of Cici's Pizza a couple of years ago. We got to learn how pizza is made and even learned some fractions too! 18) Nature Walks and Geocaching - Visit local nature centers, parks, etc and go on a nature walk. Nature walks are totally free and can provide hours of educational, fun! While you're at it try out some Geocaching too! 19) Post Office - Contact your local post office and inquire about tours. Many offer behind the scenes tours for free. It's a fabulous way for children to learn how our mail gets from one place to another. 20) Recycling Center - Learn about recycling and saving our planet by taking a visit to a local recycling center. 21) Grocery Store - Many grocery stores like Whole Foods, Publix etc offer free tours. We have done several of these and they are very educational and fun. Kids can learn about nutrition, making healthy food choices and more. The lobster tanks are always a huge hit with my kids. 22) Hospitals and Senior Centers - This is another great opportunity for kids to volunteer their time. Both of these facilities are in desperate need of volunteers and many times it's a simple task like just sitting and talking with residents. 23) Factory Tours - Contact local factories and ask about getting a tour. You will be surprised to find that many of them offer tours they just are advertised. We recently visited Mayfield Dairy. It wasn't a free tour but it was very inexpensive ($3 per person) and included ice cream, so it was totally worth it. We learned a lot and even got fancy hair nets to take home too! This website is very helpful for locating local factories that offer tours. 24) Cemeteries - I know this sounds creepy, but it can be very educational. Especially if it's a historic cemetery or if someone famous is buried there. Here is a great website with information about cemeteries. The Sleepy Hollow Cemetery is totally on our list! 25) Government Buildings - Capitols, Federal Reserves, etc offer free tours all the time. What a great way to learn about politics and government! 26) Historical Walking Tours of Cities - Many cities offer walking tours. Just stop by the cities visitor center and ask if they have a walking tour brochure. 27) Churches, Temples, Mosques - A great way to learn about different religions is to visit different places of worship. Many will gladly open their doors to anyone interested in learning more about their religion. We got a tour of a Jewish Synagogue and it was fabulous. 28) Historic Monuments, Sites, Landmarks etc. - Wikipedia has a great list broken down by state. Most of the historic sites are free or very inexpensive. 29) Water Treatment Facility - Learn about where our water comes from and how it is cleaned. 30) Airport - Contact local airports for tours, who knows maybe your kids will even get to sit in an airplane. 31) News Channel or Newspaper - Do your kids ever wonder where the news comes from? Visit a local news channel or newspaper. Maybe you will even be lucky enough to catch breaking news. 32) Local Colleges - Many local colleges offer free tours of department facilities and events. For example here in GA UGA offers an open house every year for their Veterinarian Medicine Department. 33) National Parks and State Parks - Several times a year the National Parks offer free admission. Your local State Parks might too. State and National parks offer families a variety of activities including hiking, swimming, camping, Junior Park Ranger program, Get Fit program, geocaching and more. You may even find historical buildings, historical markers and even small nature centers at many of them. 34) Historical Markers - National and global events all happened somewhere, and historical markers mark the place where many occurred. But the richness of history is in its local details, details that can be insignificant on the global stage: the home of an individual who made a difference; a natural feature, building, byway; or just something interesting that happened nearby. Markers tell stories and point out facts. 35) Bass Pro Shops - For the outdoor lover Bass Pro Shops offers seasonal family friendly events which include crafts, scavenger hunts, in store fishing and more. 36) REI - Every month REI offers free classes and events on outdoor adventure subjects. Topics include camping basics, geocaching 101 and more. 37) Reciprocal Memberships - If you have membership to a local history museum, art museum, science museum, zoo, aquarium, nature center etc make sure you check out the reciprocal membership benefits which get you into other participating locations free or at a very reduced fee. Be sure to also check out my 200+ FREE Things To See And Do In GA post! Be sure to save this post in your bookmarks or pin it because I will continue to add more ideas to it as I come across them. Totally wonderful list! I'm going to be using it a lot! Thanks! We do some of these already. What a great resource to have in one place! Great ideas! We've done some of these already but some of the others I am definitely going to look into. These are great ideas. We are traveling in August, and I need to remember them! Visiting from http://homemademomy.wordpress.com/ and I had never thought about using Home Depot or Michael's craft days in my homeschooling! That you for a wonderful idea. Can't wait to get started and expand our schooling fun. Thank you so much for posting this list. My family and I are always trying to find things to do. This will definitely be helpful. I'm going to save this. Item number 7 is sadly no longer an option. It was the Pope Dickson funeral home in Jonesboro GA. It has been sold and I do not know where the items mentioned are now. It is indeed sad for all but for my family and many that are close to me in the community, the funeral home was where many, many in the area used when a loved one died, my family included. It was where my father Clarence L. Abbott was. Those are covered in State and National parks there are too many to list them all out though I may highlight a few. The listing for the Silver Comet Trail is slightly incorrect. The trail itself is over 60 miles long, and "connects" (changes name) to Chief Ladiga Trail at the Alabama state line, making it possible to travel 94.5 miles from Smyrna, GA to Anniston, AL on the same trail. There are parking/access points at various locations from Smyrna all along the trail, including several in Powder Springs, Paulding county near Douglasville, Rockmart, etc.